Blame it on their funding model. Relying on the wholesale market for funds, non-banking financial companies (NBFCs) are easily susceptible to liquidity disruptions in the money markets. And liquidity disruptions, unless nipped quickly in the bud, can quickly become self-fulfilling. That in a nutshell is what hit finance company stocks on Friday which fell anywhere between 10-50%. But fear and dread apart, how susceptible are NBFCs to a liquidity drought? 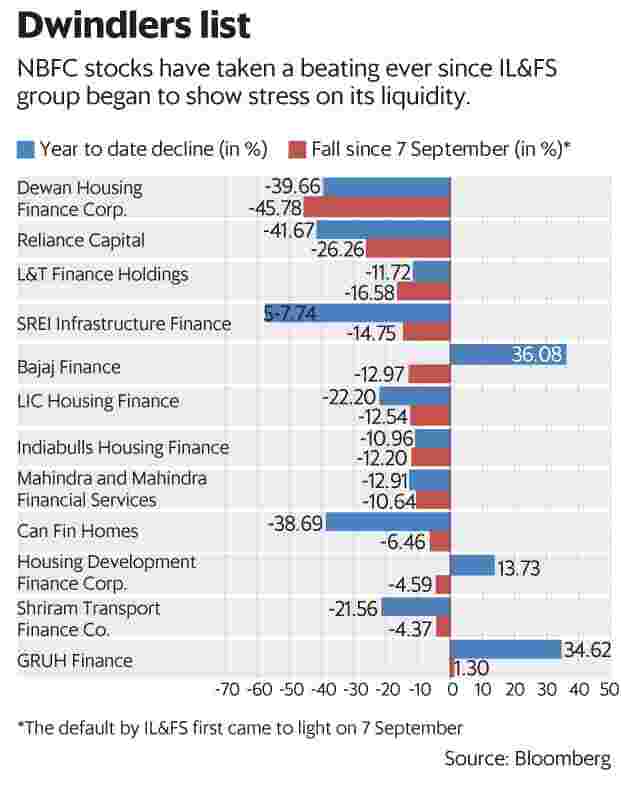 A 17 September report by India Ratings & Research pointed out, “Liquidity Shocks could result in Refinancing Challenges: While most of the NBFCs have opted for matching assets to liabilities, some of the large entities carry sizeable mismatches in the short-term (up to one year) buckets. As liabilities are re-priced faster than assets, many of these NBFCs would face NIM (net interest margin) pressure. Moreover, any sharp liquidity tightness could create refinancing challenges. This is more so in light of the banking sector challenges which constrains funding avenues." The report also said there has been a rise in short-term borrowings in NBFCs’ funding mix. Earlier, the Reserve Bank of India’s (RBI’s) Financial Stability Report had drawn attention to rising leverage in the NBFC sector. The report added that “NBFCs were the largest net borrowers of funds from the financial system with gross payables of around ₹ 7.17 trillion and gross receivables of around ₹ 419 billion in March 2018." Housing finance companies (HFCs) were not far behind. The report pointed out, “HFCs were the second largest borrowers of funds from the financial system with gross payables of around ₹ 5,284 billion and gross receivables of only ₹ 312 billion in March 2018." Banks and mutual funds were big lenders to NBFCs and HFCs. So what triggered the carnage on Friday? A mutual fund sold a handful of bonds of Dewan Housing Finance Ltd (DHFL) at a far higher discount than warranted for a top-rated security. Money market players rattled by IL&FS’s defaults were spooked enough to spread the fear among their equity market peers. The DHFL stock bore the brunt of the selling by tumbling 42%, but there was also substantial collateral damage on other NBFC stocks. The companies were quick to do damage control by clarifying that they are not defaulters but by then a chunk of investor money had been wiped out. It didn’t help that liquidity was already tight because of several factors that included advance tax outflows, the IL&FS default and the continuing weakness in the rupee. The 3-month T-bill rate went up above 7% last week. The weighted average call money rate had hardened. What exacerbated market fears was the realization, once again, that rating agencies have feet of clay, brought home forcefully as they revised their ratings on IL&FS paper pell-mell, in a desperate attempt to keep up with reality. For if ratings are open to question, as happened during the financial crisis, rumours can easily sway the markets. While the carnage looks like a one-time event fuelled by irrational fears, it has made investors take a hard look on valuations and begin to ask tough questions. Investors have begun to see the folly of sticking lofty valuations on these lenders. The chart shows how investors have slowly but surely realized this. Friday’s mayhem was a reminder to investors that NBFCs are far more fragile than banks, simply because they do not have retail deposits and have to approach the markets periodically to raise funds. What’s more, there’s always the danger of maturity mismatches, with some using short-term money to fund much longer-duration assets. A model fraught with such risks does not deserve high valuations. Of course, when a crisis crops up, the weakest links are the first to break. Even as DHFL dropped over 50%, other companies like consumer lender Bajaj Finance, mortgage behemoth HDFC and even smaller players like GRUH Finance escaped with just bruises. The wheat was separated from the chaff. The health of balance sheet matters, even in times of panic.